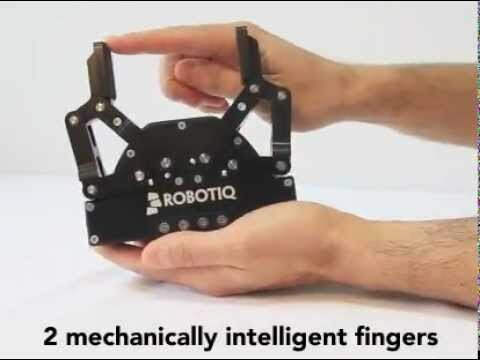 Robotiq designs and manufactures flexible robot grippers and complimentary components. We work with robot manufacturers, integrators and end-users to deliver dexterous grippers that enable new applications and improve productivity. Fully programmable, these Adaptive Robot Grippers can grip a wide variety of part shapes from flat, to square, to cylindrical, to irregular. These electric grippers have different gripping modes and precise control of speed, force and finger position, that give you the flexibility and precision to pick and place parts in machine tool or other production processes. Robotiq’s Force Torque Sensors give your robot the sense of touch. Because it’s a digital signal, the Force Torque Sensor is not affected by surrounding noise and provides a stable, precise measurement of force applied on the process or part. The latest product in Robotiq’s line-up of Adaptive Grippers is Hand-E, the first UR+ electric gripper ready for the new e-SERIES generation of Universal Robots. Hand-E’s high accuracy and 50 mm parallel stroke make it perfect for precision assembly tasks, while its sealed design ensures reliability in the toughest manufacturing conditions. Hand-E comes with a 3-fingertip kit so automation engineers can easily integrate the gripper in their application. Its compact and ergonomic shape makes collaborative robot hand-guiding safe and easy. A new grip check feature allows the robot to validate its grip with the part’s dimensions before starting the cycle. Compact and flexible this 85 mm of stroke 2-Finger Adaptive Robot Gripper has been designed to give industrial automation the flexibility needed to automate processes including a high-mix of parts. Fully programmable, this robotic gripper can handle a wide variety of parts through three distinct gripping modes: parallel grip, encompassing grip and inside pick. Robotiq releases the 2-Finger 140 Adaptive Robot Gripper, a large stroke electric gripper with advanced control features. It is able to detect that a part has been picked, as well as pick soft, fragile or deformable parts without crushing them while maintaining a safe grip when the robot is moving. The new Gripper comes with a 140 mm programmable stroke and a 2 kg payload, ideal for high-mix pick and place operations for various industries such as electronics, consumer goods and logistics. Designed for applications dealing with a wide variety of parts, the 3-Finger Adaptive Robot Gripper represents a solution to improve process flexibility and consistency. 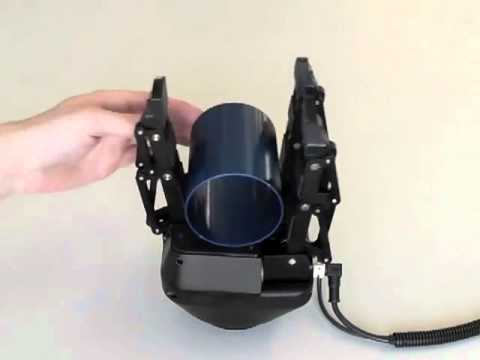 This robotic hand gives “hand-like” capabilities to robot arms in advanced robotic applications and industrial automation such as robotic welding, machine loading/unloading, bin picking and research. Vision-guided pick and place solution for Universal Robots that can be setup on a shop floor in 5 minutes. No external PC is required to setup, program or run the Camera. Everything is done right from the robot user interface. The compact camera design fits perfectly on the UR wrist and offers direct connectivity to the controller. Moreover, the Robotiq Camera’s user friendly software is seamlessly embedded within Universal Robot’s graphical user interface.